Colcannon is an Irish mashed potatoes recipe. 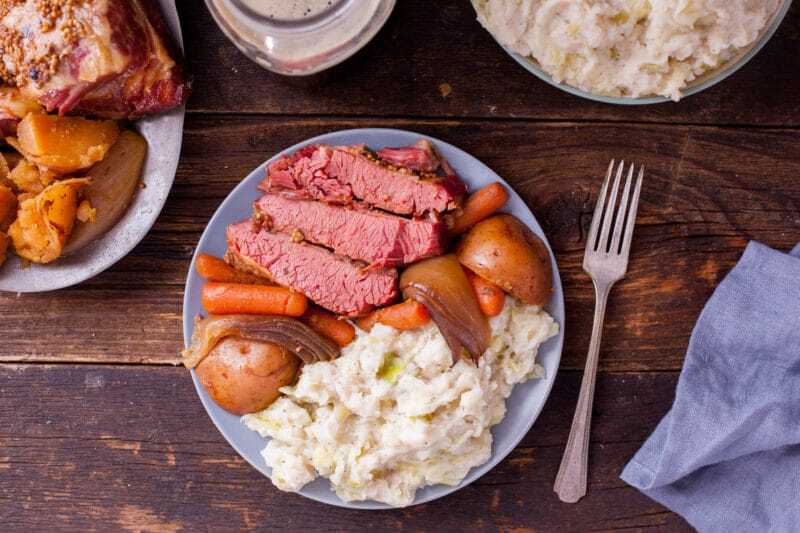 It’s also one of the easiest dishes you can make for a traditional St. Patrick’s Day dinner. 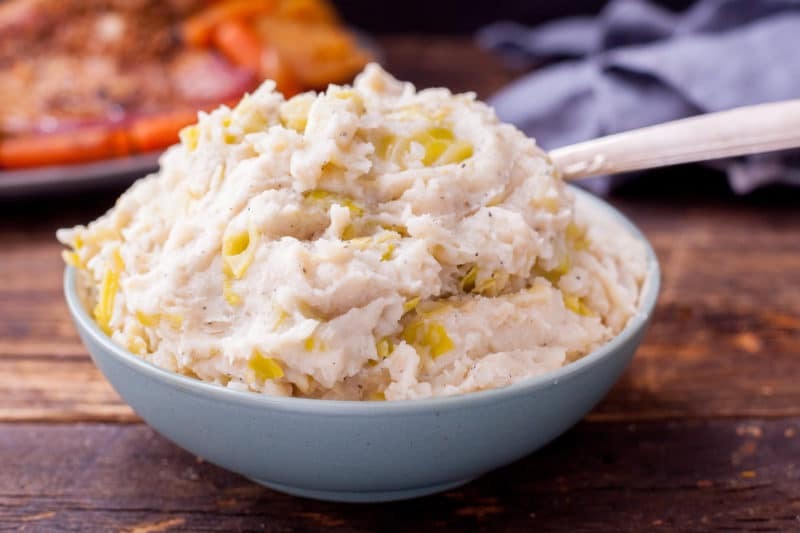 Irish Mashed Potatoes, or Colcannon, are a traditional Irish recipe dating back hundreds of years. 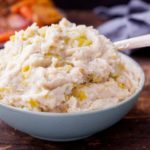 Cooked cabbage and onion are mixed with mashed potatoes for a very easy side dish. Don’t want the history of the dish, tips on freezing colcannon,or accompanying dishes? Click the button below to jump straight to the recipe. 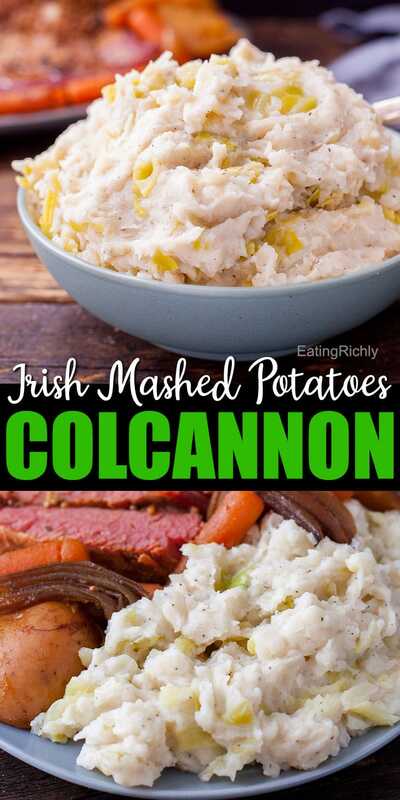 WHAT IS COLCANNON OR IRISH MASHED POTATOES? Simply put, colcannon is mashed potatoes mixed with some combination of cooked kale or cabbage, and onions or leeks. You can make it fancy by cooking the vegetables with bacon, or adding additional flavors. But traditional Irish mashed potatoes are very simple. I just love learning the history of traditional cultural dishes. The history of potatoes in Ireland is quite an exciting one! 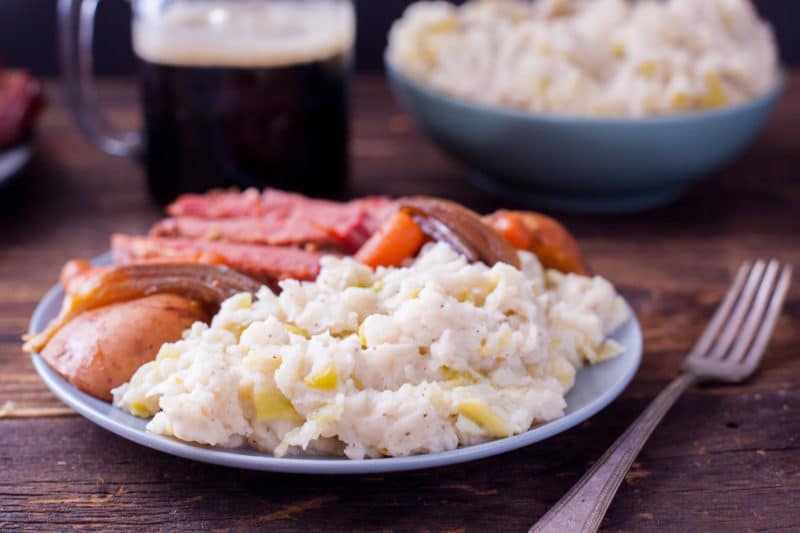 Colcannon recipes can be found from the 1800’s, and food historians generally agree that it is a dish that started with the Irish. In Medieval Europe, cabbage and onions were everyday commoner food. They were eaten daily, included in most meals. Spanish conquistadors encountered the potato in Peru in the 1500’s and brought them back to Spain. An Irish legend says that Spanish ships wrecked off the coast of Ireland in 1588 and potatoes washed ashore. But in 1589, British Explorer Sir Walter Raleigh brought potatoes to be planted at his Irish estate. There are so many fascinating stories on the history of Colcannon, included its use as a divination tool to determine who you would marry. If you’d like to read more, you can find lots of tidbits about these Irish mashed potatoes on Food Timeline. Now it’s time to dive into the recipe! If you can make mashed potatoes, you can make colcannon. If you can’t make mashed potatoes, don’t worry. You will be able to by the end of this post! Start by cooking your potatoes. You will need 6 large russet potatoes, peeled and cut into chunks. Put the potatoes in a pot and fill with cold water an inch above the potatoes. Add a tablespoon of salt and bring the water to boil. Cook the potatoes for 15 or 20 minutes, until they are easily pierced with a fork, then drain well in a colander. The next step is finely chopping up three cups of green cabbage. If you’re in a hurry you could use a bag of pre-shredded cabbage that would normally be for coleslaw. Then finely chop an onion. Place the cabbage and onion in the pot with about ½ cup of water. Bring the water to a boil, then reduce the heat to low and cover the pot. Simmer for 8 minutes until the cabbage and onion are tender but not mushy. Drain the cabbage and onion, then add the potatoes into the pot with them. Add ¼ cup of whole milk or cream, and ¼ cup of melted butter. Use a potato masher or wooden spoon to stir together and mash the potatoes. Once well mixed and heated through, season with salt and pepper to taste. You may also add garlic or green onions to you Irish mashed potatoes for additional flavor. 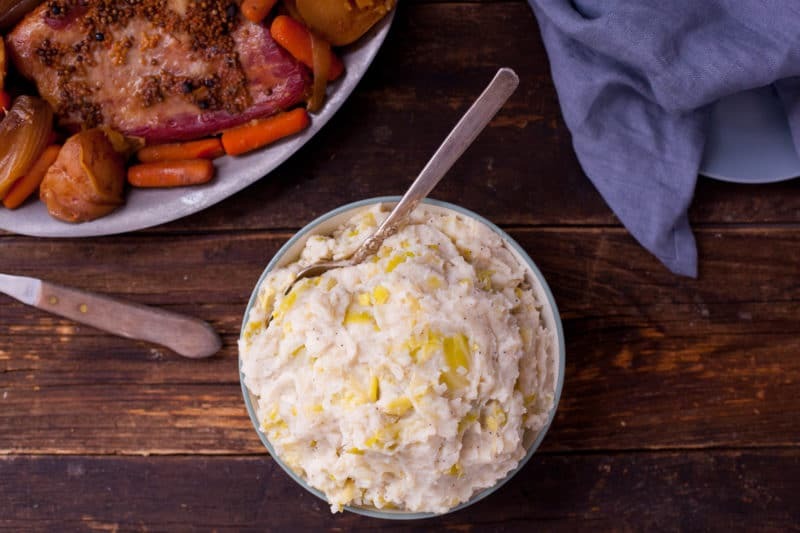 CAN YOU MAKE COLCANNON WITH INSTANT MASHED POTATOES? Irish chefs would likely be horrified, but I have made my Irish mashed potatoes with instant potatoes as often as I have fresh. Just use 4 cups of instant mashed potatoes prepared according to the product instructions. If the instructions have you add milk or cream and melted butter, you can leave those out of the colcannon recipe. If you have leftovers, or are hoping to do some prep well in advance, you may be wondering if you can freeze colcannon. You can definitely freeze colcannon, and how to freeze it depends on what your plans for the future are. If you are freezing leftovers that you will want one serving at a time, line a baking sheet with parchment paper. Scoop single serving piles (3/4-1 cup) onto the paper and stick the whole thing in the freezer. Once the scoops or Irish mashed potatoes are solid, you can move them into a gallon bag in the freezer. If you are freezing a full batch to serve at a later date, scoop the colcannon into gallon sized freezer bags. Squeeze all the air out, seal tightly, and freeze. Defrost in the refrigerator the day before you’re ready to serve. WHAT DO YOU EAT COLCANNON WITH? 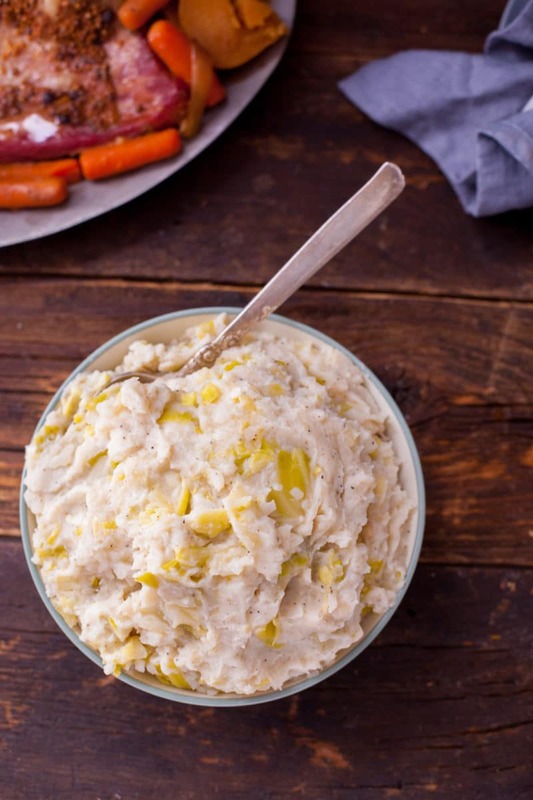 Wondering what to serve with colcannon? Irish mashed potatoes are a great side dish for almost any meat. 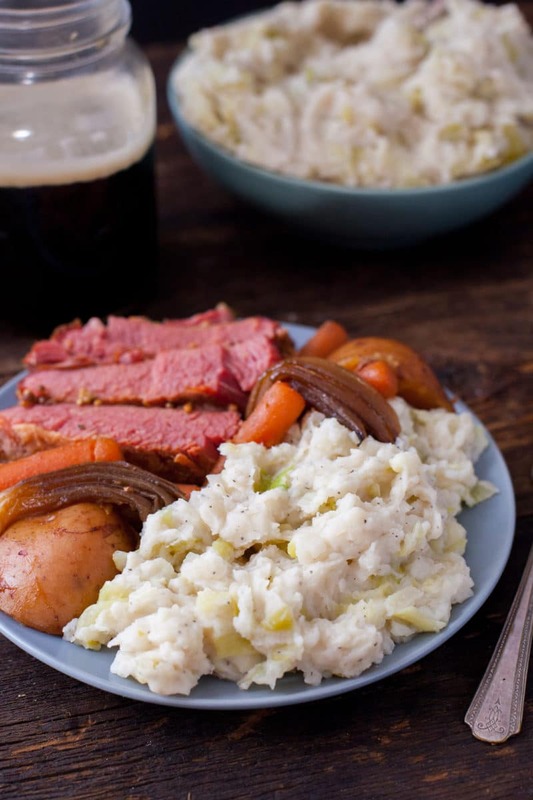 The traditional St. Patrick’s Day dinner would have corned beef with colcannon. I also like to include some roasted vegetables to round out the meal. If corned beef isn’t your favorite, these potatoes would go perfectly with a good ham recipe, or some oven roasted lamb chops. And they would be amazing under a pile of pressure cooker short ribs! 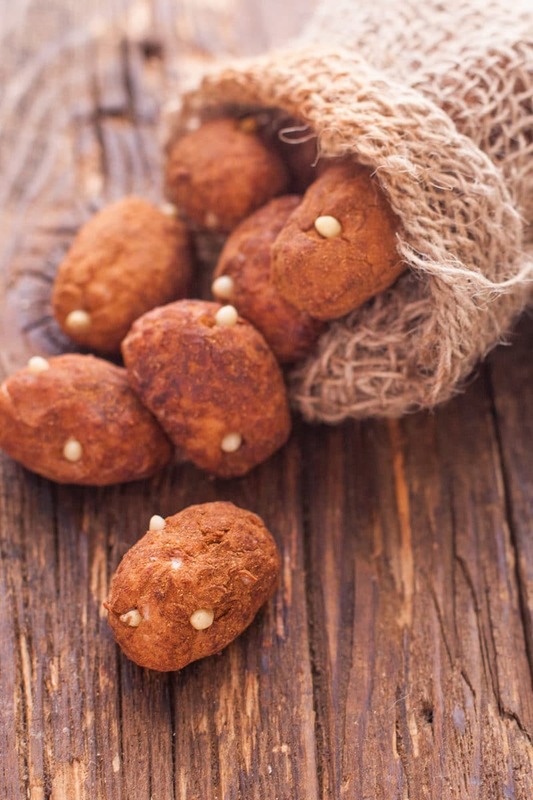 And if you are loving the Irish potatoes lore, make sure to check out our adorable Irish potato candy for dessert! Don’t lose the recipe! Pin to save the recipe, and then leave a photo in the comments of the pin once you’ve tried it. We love to see what you make! Colcannon is an Irish mashed potatoes recipe. It’s also one of the easiest dishes you can make for a traditional St. Patrick’s Day dinner. Feel free to swap the cabbage with kale or the onion with a sliced leek. Adapted with permission from Genius Kitchen. Place the cabbage and onion into the pot the potatoes cooked in. Add 1/2 cup water. Bring the water to a boil, then reduce the heat to low and cover the pot. Add milk and melted butter to the pot. Planning to use Instant Mashed Potatoes? Just use 4 cups of instant mashed potatoes prepared according to the product instructions. If the instructions have you add milk or cream and melted butter, you can leave those out of the colcannon recipe.